If you've either got a small bedroom or a 'funny' shaped one such as an L-shape, then you know just how much of a nightmare arranging bedroom furniture can be. Regardless of your bed size, there are ways you can make the most out of space available to you. First off you're going to need to look at the space you have available in terms of window and door layout. Of course this means breaking out the tape measure to see what you have available! Try and think of where bedroom furniture could go, wardrobe, bedside table, dressing table and perhaps a chair? You're not going to need all of these items listed above, especially if your bedroom is very small, so you'll need to prioritise your essential pieces of bedroom furniture before you start trying to squeeze other pieces in. You want to try to leave as much open floor space as you can at the entrance, for obvious reasons. Have a good think about pieces of bedroom furniture you actually need in terms of practicality. Do you really need a dressing table if you get ready in the bathroom most mornings? Do you need a double wardrobe, you could get a single if you don't own many clothes, or what about getting rid of the chest of drawers and using a wardrobe with drawers? Where should your bed go? Being he main focal point of any bedroom you need to get this right! The usual place a bed goes is against the opposite wall of the door, towards the middle. However this isn't always possible, so the second best choice is usually against the longest wall, just be sure to bare in mind that if you're sharing the bed you both need room to get in! "What if I have an odd shaped room?" I hear you say! This is where you have to get a bit creative and possibly sacrifice some other bedroom furniture pieces that some people may class as essential, but you need a bed! So priorities and all that. It may be a case with some bedrooms with angled walls, that you only have one place to put your bed, so you have to work around it and be creative with other pieces of furniture. If you have an L-shaped bedroom you have a great opportunity to section off areas of your bedroom without separating your decor theme completely, you can effectively do this by using rugs. Your bed should go in the 'concealed' area of the room, so you have more space elsewhere for other furniture. Just because you have a smaller bedroom doesn't mean you can't have the furniture you want, though you may have to compromise a little. A good example is placing your chest of drawers opposite your bed, so you can use it as a place to put your television or alternatively if you prefer to wall mount your TV you could put a vanity mirror on the chest of drawers to create a dressing table type that you stand at instead of sit. Considering beds with storage is another option if you're stretched for space, using the drawers in the divan base for your clothes instead of having a chest of drawers can work, check out our divan base buying guide by clicking here for more information. Another option which is excellent for storage is ottoman storage. If you've got a built in wardrobe with space at the bottom, you could free up more space by putting your chest of drawers inside it. - No space for bedside tables at all? Hang a shelf on the wall besides your bed! - Use ceiling lights by your bed to create atmospheric lighting whilst reading, and also to free up space on your bedside table surface. - Mirrors are excellent at creating space. Tall ones make the room feel higher, and longer ones make the room feel wider. 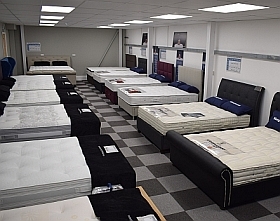 Your independent mattress and bed retailers providing outstanding savings to Bournemouth, Christchurch, Wareham, Swanage, Dorchester, Blandford, Wimborne and Poole!